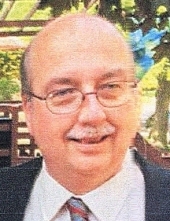 Stephen F. Cudworth, 58, of Camillus, passed away Monday, February 4, 2019. He was a lifetime resident of Syracuse and Navy veteran. Stephen earned his associate degree in technology and was employed at the Camillus Senior Center. He was kind, generous and always there to help. He enjoyed animals, watching movies and playing cards, but above all, loved spending time with family and friends. Stephen was predeceased by his mother, Clara, in 1970; and father, J. Robert, in 2013. Surviving are his wife of 31 years, the former Shelly Taylor; daughter, Tracy Cudworth of N. Syracuse; sisters, Jacqueline (William) Cross of Marcellus and Suzanne (Elaine Burgher) Jerrett of Indiana; stepmother, Catherine "Kay" Cudworth of Camillus; and many nieces and nephews. Relatives and friends may call Saturday, February 9 from 1 to 3 p.m. at the Buranich Funeral Home, 5431 W. Genesee St., Camillus. Services will follow at 3 p.m. at the funeral home. Stephen will be laid to rest in Maplewood Cemetery, Camillus. In lieu of flowers, contributions may be made to the Humane Association of CNY, 4915 ½ W. Taft Rd., Liverpool, NY 13088. To send flowers or a remembrance gift to the family of Stephen F. Cudworth, please visit our Tribute Store. "Email Address" would like to share the life celebration of Stephen F. Cudworth. Click on the "link" to go to share a favorite memory or leave a condolence message for the family.